Here’s a list of some of the top illumination displays in central Tokyo. These are great places to visit during the dark winter months, and they’re all free. Be prepared for some illuminations to end on Christmas Day; check Time Out Tokyo ( http://www.timeout.jp/en/tokyo) for specific illumination dates. 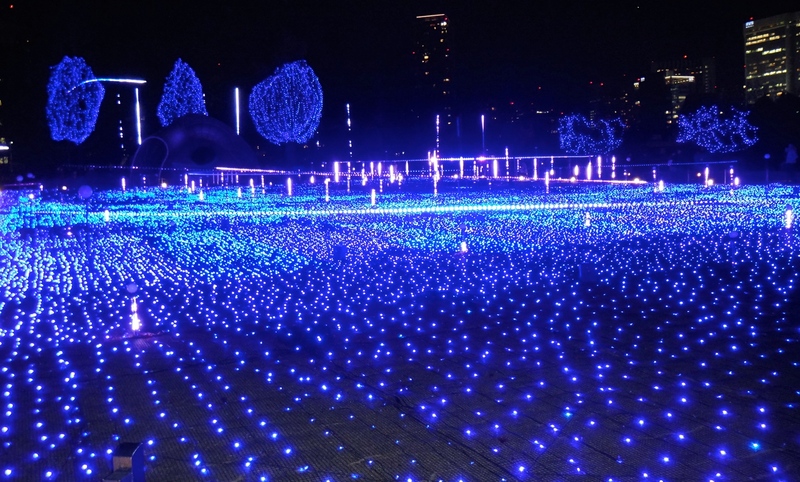 I have listed the destinations in order of my preference, however, Sagamiko Pleasure Forest’s winter illumination is my most favorite illumination around Tokyo (2014-15). – Midtown Tokyo: (Roppongi Station, Hibiya Line – H04, exit 8). This mall has a nice light tour from the Plaza, along Higashi Street and through the Garden. It ends with an amazing finale at the Grass Square. The lights run from 17:00 – 23:00, between the middle of November to Christmas Day. – Nakameguro: (Naka-meguro Station, Hibiya Line – H01, North exit). Cross the road, after you take the North exit, and follow the crowd north. These amazing canal lights give you the impression that the river runs through a beautiful blue cave. 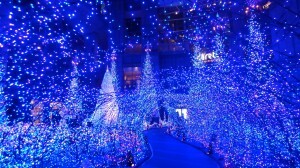 The lights are lit 17:00 – 21:00 from the end of November to Christmas Day, EXCEPT WEEKENDS!※The blue illumination relocated to Yoyogi park in 2016. The trees are illuminated in an orange-gold color in 2016 instead. This illumination differs every year. Please make sure to check the info before you visit there! The above blue cave has relocated to Yoyogi park in 2016. Please see the separate entry for more information. – Shiodome: (Shiodome Station, Oedo Line – E19, or Shinbashi Station, connected to several lines). The Caretta mall runs an illumination show every 20 minutes. The GPS coordinates for the display are 35.6648195,139.7624616. Illumination is from 17:00 – 23:00 and begins mid-November to mid-January. – Roppongi Hills/Keyakizaka Street: (Roppongi Station, Hibiya Line – H04, exit 1C). This romantic illumination is located near Mori Tower, and in previous years, they have had a Christmas market that runs until 9 pm. The GPS coordinates for the Roppongi Hill lights are 35.6592006,139.7298473 and the trees are lit 17:00 – 23:00, from early November to Christmas Day. 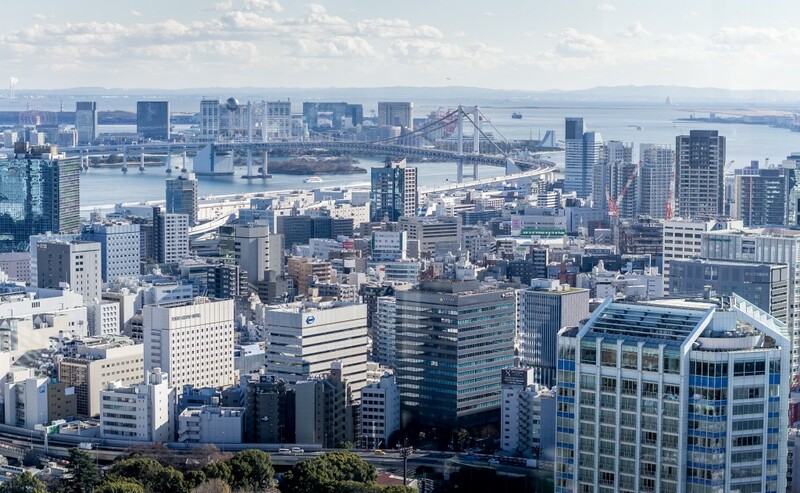 The 4 locations, above, can be visited relatively ‘easily’ as most of them are on the Hibiya Line, but there is quite a bit of walking involved. I suggest seeing the lights at Nakameguro (H01) first, since these lights turn off the earliest and ending with Tokyo Midtown or Shidome. To get to Shiodome, take the Oedo Line to Shidome (E19) from Roppongi Sation (H04). – Tokyo Dome/La Qua: (Served by several lines and can be reached via Kasuga Station, Korakuen Station, exit 2 or Suidobashi Station, West exit). When we went to this display, it was not vast, like the illumination spots above. However, it was colorful and the frequent light shows were well choreographed to music. You may want to see the ‘fountains to music’ display at La Qua too. La Qua also has over 50 restaurants located on the Ground floor and 5th floor. You can see the lights between 17:00 – 01:00 from early November to mid-February. – Shinjuku: (Shinjuku Station also served by a number of lines including the JR Yamanote Line, South exit). There are displays all around Shinjuku Terrace City with a number of them located on Shinjuku’s Southern Terrace, south of JR Shinjuku Station. The lights are generally lit from 17:00 – 24:00 mid-November to mid-February. You can catch some Valentine’s Day lights here too. – Between Meji-jingumae Station and Omotesando Station: (Meji-jingumae Station, Chiyoda Line – C3 or Fukutoshin Line F15, and Omotesando Station, Chiyoda Line – C4, Ginza Line – G2, or Hanzomon Line- Z2). Meiji-jigumae Station is a 10 minute walk from Harajuku station which is on the JR Yamanote Line. Along this ritzy stretch of road, there are a lot of lighted Gingko trees. On the left as you go from Meiji-jingumae Station to Omotesando Station, you can take a quick look at the illumination displays on the rooftop in Tokyu Plaza, next to Starbucks, and then further down the road inside the Omotesando Hills Shopping Mall; where there is a 26 foot tall fake Christmas tree and a cute miniature German house scene. You can catch the lights between sunset and 21:00 from early December to early January. – Yebisu Garden Place: (Ebisu station, Hibiya Line – H02, and the JR Yamanote Line to name a few lines. exit 1 or East Exit). This is a 10-15 minute uphill walk from Ebisu Station, or if you can find it, the “Yebisu Skywalk” is easier. The GPS coordinates for this illumination display are 35.6426292,139.7137002. When we visited, the plaza had a red carpet lined with lit trees and a gigantic crystal chandelier at the end. This illumination is generally lit between 16:00 – midnight and runs November to mid-January. – Tokyo Tower: (Kamiyacho Station, Hibiya Line, exit 1 or Onarimon Station, Mita Line, exit A1 or Akabanebashi Station, Oedo Line – E21, Akabanebashi exit). 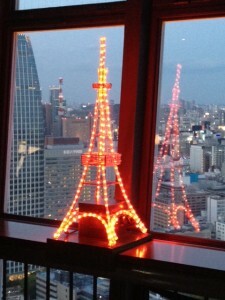 Besides the tower itself, there are other lights at the base of the tower that are usually theme based. The year we went the lights ‘worshipped’ some anime creature that we didn’t know. It costs 900 yen to get to the main observation tower. 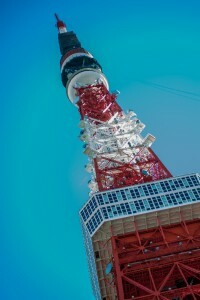 For more information on Tokyo Tower, see this Yokota Travel entry http://yokotatravel.com/welcome-fellow-yokotans/tokyo-tower/. These lights are lit between 16:00-0:00 and run between early November to December 25. 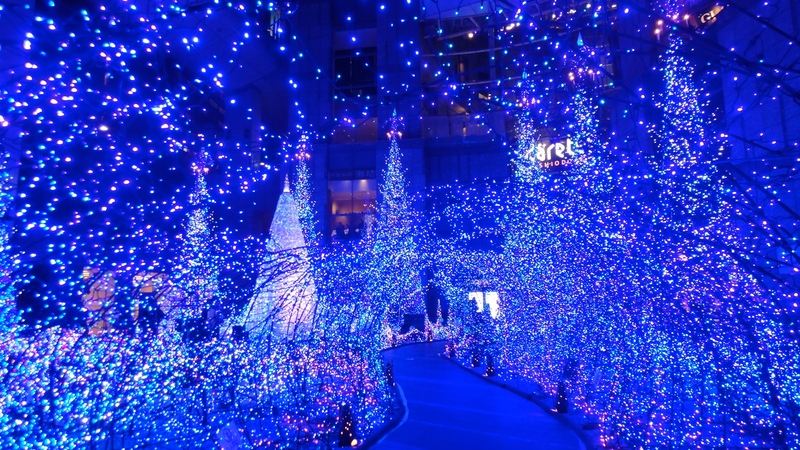 Here are a few more illumination destinations that I have not visited, but are well-known illumination spots in central Tokyo. They are a little further from Yokota, but good spots to check out if you are staying at the New Sanno during the winter months. – Tokyo Station: (Tokyo Station is serviced by a number of lines. Use Yaesu exit and exit 4a/4b for Michi Terasse). Tokyo Station usually has a couple of attractions from 17:00-23:00 early December to early January. Tokyo Station’s, Yaesu, Grand Roof is lit with alternating colors. From 16:30-20:30. December 24-28/29 Tokyo Station’s Michi Terrace (or Tokyo Station’s façade) usually has an annual 3D holographic projection display. – Tokyo Skytree: (Oshiage Station is also serviced by a number of lines). The Solamachi Christmas Market and Christmas illuminations around Tokyo Skytree run from 10:00-22:00 early November to Christmas Day. The pathways connecting the tower, Tokyo Skytree and Oshiage Stations are lit from mid-December and you can usually see projection mapping shows as well. – Ginza District: (Ginza Station on the Hibiya, Marunouchi and Ginza Subway Lines and Yurakucho Station on the JR Yamanote Line, JR Keihin-Tohoku Line and Yurakucho Subway Line). 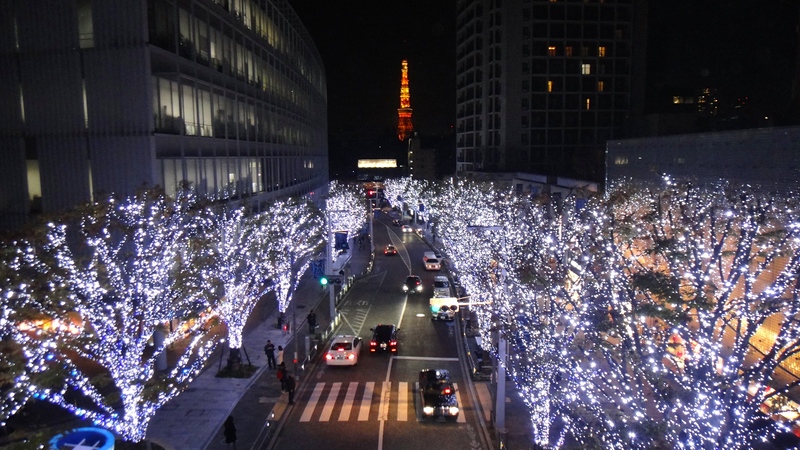 The lights in Ginza are generally lit between 11:00-22:00 from mid-November to mid-February. – Odaiba: (Daiba Station, Yurikamome Line). Odaiba has a large “Daiba Memorial Tree” lit from 17:00-01:00 in mid-November to mid-March. 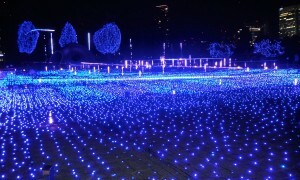 Other illumination points around Odaiba include “Odaiba Kaihin Park, in front of the of Decks shopping center, Venusfort and Diver City”, according to http://www.japan-guide.com/e/e2303.html. If you are in the neighborhood, Randy, a bistro located near the U.S. Embassy, is a great lunch spot. The day I went the special was off the new Fall menu and included grilled mushroom curry that mirrored a huge bowl of French onion soup in terms of preparation and presentation. It was loaded with fresh mushrooms, rice, curry, and cheese. Also enjoyed the ‘Fall cabbage roll’, that was a lot like a ‘pig-in-a-blanket’. It contained a mix of pork, was wrapped in bacon, and covered in a mushroom based sauce. Prices for both entrees were right around ¥1200. They also have a great homemade ginger ale and ample outdoor seating. 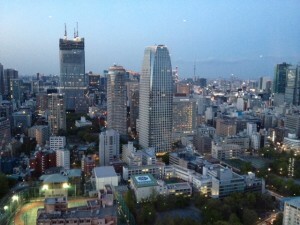 LOCATION: It’s located just up the street from the US Embassy in downtown Tokyo at 〒106-0032 Tokyo, Minato, Roppongi, 1−3. (GPS 35.665935, 139.741403). Phone number: 03-3568-2888. Closest train station: Roppongi Itchome. Webpage: cafe-randy.jp. – Andrew Campbell, September 2013. *The wax museum in the write up has been closed since September 2013. 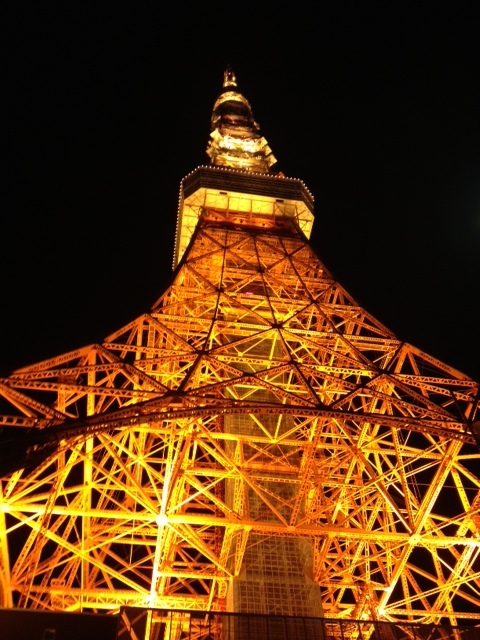 For that “high in the sky” look at Tokyo, climb to the observatory levels of Tokyo Tower, located in Roppongi. The main observatory platform is 150 meters high, and the special observatory gives you a panoramic view, including the harbor and bay, from a height of 250 meters. Both levels offer a stupendous look at the greater Tokyo area, and on a clear day you will even see Mt. Fuji rising majestically into the sky. At 333 meters, Tokyo Tower is no longer the city’s tallest structure, that honor now goes to Skytree, but it is cheaper to go up and the lines are shorter. All eight television stations and five radio stations in the Tokyo area beam their signals from antennas installed atop the tower, and the police department has cameras mounted to it to monitor traffic on surrounding expressways and other main arteries. If you are in the tower 15 minutes before sunset you can enjoy the view by day and watch the cities lights turn on as it grows dark. Construction of Tokyo Tower began in June 1957 and was completed in December 1958. Although it is higher than the Eiffel Tower, it is much lighter with 4,000 tons of steel as compared with 7,000 tons needed to build the French structure. 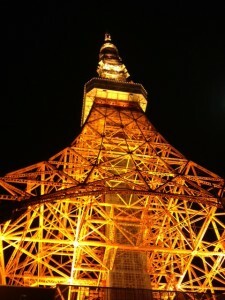 Even so, Tokyo Tower is solid enough to withstand both the strongest earthquake and 90-meter-per-second winds. Under the tower, the Tokyo Tower Building houses exhibits and offers both entertainment as well as education. An aquarium on the first floor is Japan’s largest, with 8,000 fish representing 700 species from all over the world. Included are examples of Japan’s renowned carp and goldfish. The 3,500 square-meter, two-story tourist area includes souvenir shops, restaurants, coffee shops and a game corner. On the third floor, see the first wax museum built in the Orient. One hundred lifelike figures of famous persons are presented and dramatic scenes enhanced by special lighting and sound effects.If you are interested in learning about modern Japanese life, don’t miss the fourth floor. Numerous showrooms feature exhibits by the government as well as Japan’s leading companies. Advances in technology are displayed in the form of up-to-date examples of cars, computers and kitchens. The showroom of Japan Automobile Federation offers exhibits useful to drivers interested in improving their driving skills. Fees to the main observatory are: Adults, ¥820, middle/primary school age, ¥460; kindergarten, ¥310. Fees to the special observatory cost an additional ¥600 for adults, ¥400/350 for children. Fees to see the wax museum are: Adults; ¥500; children, ¥350. Fees for the aquarium are: Adults, ¥1000; children, ¥500. No credit cards accepted for tower entrance. TRAIN DIRECTIONS: Take the Ome Line to Tachikawa. Change to the Chuo Line and travel to Yotsuya Station. Change to Marunouchi Subway Line bound for Kasumigaseki (3 stops). Change to the Hibiya Line for Kamiyacho Station (1 stop). Get off the subway and exit the station either way. Turn left and walk one block. Turn left again, and the Tokyo Tower is right there! Or, it is only a ¥1300 taxi ride from the New Sanno. Opening Hours: 9am–10pm. –Barbara Smith. Liz Ruskin updated hours and fees, 2011, updated with photos Kelly O’Donnell, May 2013, top photo by Valerie DeLello, Dec 2013. Also check out Tokyo Skytree. Comments & last two photo by Sarah Straus, December 2013: You can get a reduced price ticket to the Main Observatory plus a free dessert on your birthday. Also, the day we went in December there was plenty of parking in the parking lot located at the base of the tower. This district is a favorite among night-clubbers and the younger foreign crowd, and it’s not far from the New Sanno Hotel. Here you will find coffee shops, bars, discos and restaurants for people of all cultural backgrounds and tastes. Trendy people come out to liven up the area on the weekends. 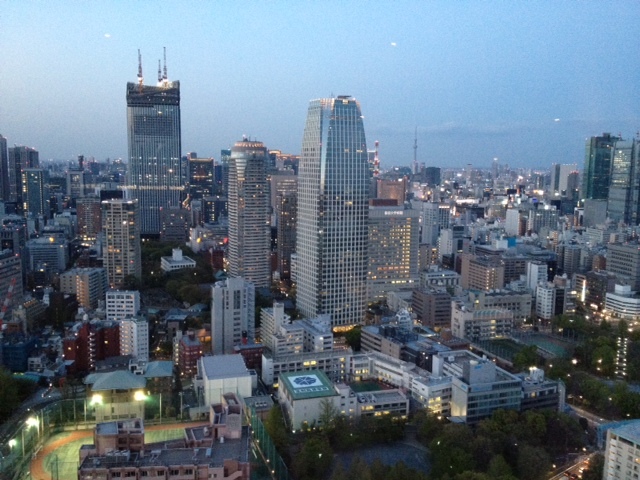 Yet Roppongi is not only for the party-goers. It also provides an atmosphere for people interested in culture, theater and museums. Shopping is expensive, but there are some shops that are reasonable in Roppongi. Many of the clothing store prices are based on the latest fashion trends. Most people go to Roppongi for the countless bars and restaurants that line its streets. It’s also home to American favorites such as Hard Rock Café, Tony Roma’s Ribs and Johnny Rockets. GENERAL DIRECTIONS: It takes about 1-1.5 hours to get to Roppongi from Yokota. Take the Ome Line to Tachikawa or Tokyo. Switch, if necessary, at Tachikawa for the Chuo (orange line) for Tokyo. Get off at Yotsuya, one stop after Shinjuku. Change to the Marunouchi Line and get off at Roppongi. It’s just a 30 minute walk from the New Sanno (less if you use the subway) and 10 minutes from Hardy Barracks. Or, if you’re leaving in the morning, catch the daily shuttle to the New Sanno Hotel. It leaves the Kanto Lodge at 9:30am and costs $8. One of the several book stores with English books is found in the Roppongi area. Aoyama Bookstore is near Almond’s and the main Roppongi intersection under the highway. The Wally Yonamine Pearl Company, affectionately known as Jane’s Pearls, is located on one corner of Roppongi Crossing outside Roppongi station on the Hibiya (exit 4A) and Oedo Subway Lines or about a 25 minute walk from the New Sanno Hotel (ask for a map). Jane’s carries a selection of jewelry, with $ prices depending on the yen rate and cost of gold, ranging from inexpensive freshwater pearl bracelets to valuable larger diameter cultured pearl necklaces. If you don’t know much about pearls, Jane’s can give a detailed introduction on the different types and sources. The popular t-shirt necklace of seed pearls, often given to young women, can be worn all year long and dressed up with a pendant, while the so-called Jodie Foster necklaces in white or yellow gold with red, blue, or green enamel spacers cost three times more due the increase in gold price. Jane’s also has opera length strands of different colored fresh water pearls which can be combined into an elegant twisted necklace. Open 9:30am-5:30pm Monday-Saturday, closed Sundays and Japanese holidays. Look for the blue and white “pearls” sign in the entrance of the Arts Shop building, and take the small elevator to the 5th floor. Credit cards OK, janespearl.com; Tel. 033-402-4001 or 033-403-4687. While Amit has a branch at the New Sanno, their main store is on the 5th Floor of the ISO Building, next to the Softbank shop on the corner of Roppongi Crossing opposite Jane’s Pearls. While Jane’s seems to carry a larger array of designs, Amit’s is known for good prices in custom gem jewelry and traditional cultured pearl strands as well. If you know what you want or have a specific design in mind (whether for a necklace, earrings, bracelet or other accessory), check with Amit. Open 9:30am-5:30pm weekdays, www.pearls.jp; 033-3404-3853. Noted in Frommer’s guides, Asahi (Shoten) Jewelry has stores within the Imperial Hotel arcade and 1st Floor of the Yurakucho Building outside Exit A-3 of the Hibiya Subway Station. While not as popular with the base crowd, Asahi also carries a selection of moderately priced pearl and gem jewelry. Open weekdays 10am-7pm, 10am-6:30pm weekends and holidays. 03-3271-6260. The Roppongi Roi Building (near the Hard Rock Café and Spago’s) houses a flea market on the fourth Thursday and Friday of each month. It has more than 30 dealers, and the prices are said to be good. Hours? TRAIN DIRECTIONS: From Fussa Station, take the Ome Line to Tachikawa. Change to the Chuo Line to Shinjuku. Transfer to the Yamanote Line to Ebisu. There, change to the Hibiya Line and go two stops to Roppongi. Exit the ticket turnstile and turn right. Go upstairs and turn left. On the corner across the street, you will see the Almond Cafe (large pink sign). Cross the street to the cafe, turn right at the corner and go one and one-half block. The next big corner will be the Roi Building. For more information call the Kottoichi Company at 03-3980-8228. Uchida Is this store still around? It’d be nice to have an update, and an address or GPS coordinates. For a unique shop/gallery with a wide array of art and artifacts from all over the world, visit Uchida, located in Azabu. They carry Indonesian baskets, Japanese lacquerware, clay figures, textiles from all over the world, and more. Uchida provides a showcase for a collection of art and gallery space for artists to show their work. DIRECTIONS: Exit the Roppongi Subway Station using the Roppongi Crossing Exit. Turn down the side street to your right. Follow this street past the Swedish Center and Homeworks. Turn right at the gas station, and at the second corner, turn right again. It is only about a block from the Blue and White Store (under the New Sanno section). Hours: open daily until 7pm, except Tuesdays and the 1st and 3rd Wednesdays. Also open on holidays. Melody Hostetler, date? DIRECTIONS: Take the train from Fussa Station to Ebisu, then take the Tokyo Metro to the Roppongi Station. Exit the station onto Roppongi Dori (crossing under the street) and turn left. Walk about 850 meters to the intersection of Roppongi Dori and Gaien-Nishi Dori (second major intersection). The restaurant is on the corner to your right. It is across Gaien-Nishi Dori from Zest, and diagonally across Roppongi Dori from a Hobson’s ice cream shop. Kevin Green, 2012. This small groovy eatery has California-style pizzas with excellent options for vegetarians and meat-eaters alike. The name is a contraction of “pizza” and “izikaya,” a casual Japanese pub. The atmosphere is relaxed and retro, and the selection of American craft beers is excellent. You’ll fee like you’re in Santa Cruz again, though the prices (¥2100 for a medium 10-inch pizza) will remind you that this is still Tokyo. The two-person set for ¥4725 seems like a good deal. The menu includes big salads and pasta. It’s convenient to the New Sanno, and they do deliver. English menu and English-speaking staff. Hours: Lunch: Mon-Sat, 11:30am-2:00pm (Except Japanese national holidays). Dinner: 5-10:30pm (-9:30pm Sundays) Address: Dai-ichi Koyama Building 2F, 3-1-19 Nishi Azabu, Minato-ku, Tokyo 106-0031. Tel: 03-3479-8383. GPS: 35.6605, 139.7266. Directions from Roppongi Station: Take Exit 1C (Hibiya Line, Oedo Line), turn left and walk away from the Roppongi Intersection, towards Roppongi Hills. After Roppongi Hills you will come to the intersection of Roppongi and TV Asahi streets. Cross the street and keep going about 100 meters toward the Nishi Azabu Intersection until you reach a restaurant called “Charleston Cafe Oriental.” Pizzakaya is on the second floor of the next building. There’s a sign out on the street. It is about a seven-minute walk. Directions from New Sanno Hotel: It’s a 1.8km walk. Turn right out of the hotel and right again at the next major road, which has a pedestrian bridge overhead. Walk up hill, passing the Hiroo Metro stop. Keep going along this road until you get to Roppongi Dori, which has an elevated expressway down the middle. Turn right on Roppongi Dori and go about 300 meters, until you see the blue-trimmed Papasu Pharmacy. Pizzakaya is in the next building, on the second floor. If you get to a dark building with the sign “Charleston Cafe Oriental” you’ve gone a few steps too far. Liz Ruskin, 2012. The Hard Rock Café in Tokyo is like any other Hard Rock. Americans and others fill the place, listening to classic rock and viewing paraphernalia donated by some of America’s best music artists. Food selections are also the same. Starters range from homemade soup (¥600) to pizza (¥1400)). Salad and sandwich choices include chef, chicken, and fruit/avocado salads, HRC Sandwich, BLT, and the awesome California Club (¥1,300-1,600). Last, but not least, for the “American palate,” there is the charbroiled burger, cheeseburger, bacon cheeseburger, and Mt. Fuji Double Burger (¥l,400-2,000). Desserts are plentiful: Apple pie, devil’s food cake, brownies, Key lime pie, N.Y. Cheesecake, etc. The servers speak English, and there is no dress code. Address: 5-4-20 Roppongi MinatoKu, Tokyo 106. TRAIN DIRECTIONS: Pay parking is available, but it is easy to go by train. From Fussa Station, take the train toward Tokyo. Change trains at Shinjuku Station and get on the Yamanote line (lime green) to Ebisu (four stops). Exit and to the right will be the subway station. Take the Hibiya line two stops to Roppongi and exit from Exit 3. Turn left out of the station and cross the street to your right. Turn left. Turn right after the Almond Restaurant (pink and white canopy-also on the right). You should see Tokyo Tower straight ahead. Follow this road until you see a McDonalds on your right. Turn right directly past it and Hard Rock Café /Tony Roma’s is ahead of you. If you get lost, ask. Hard Rock is well known. Hours: 11:30 am – 2:00 am (Monday-Thursday), 4:00 am (Friday-Saturday), and 11:30 pm (Sundays and holidays). Tel: 03-3408-7018 Karen Ozment, Delores Street, date? Located in the bottom half of the Hard Rock Café building, this one is also an international classic. It attracts a more business-like crowd so most people are dressed in work attire (as in no shorts). Specializing in ribs, Tony Roma’s charcoal broils them and adds barbecue sauce to make them as tender as anything Memphis has to offer. Order the onion rings for ¥780. They are absolutely mouthwatering and feed 3-5 people. Other appetizers include fried cheese, shrimp tail fingers, cold fresh asparagus and country pork sausage with dijon mustard, all for ¥980. Salads include seafood, Mesa Verde, garden, Cobb, and Santa Fe, ranging from ¥650-1,450. Tony Roma’s original barbecued baby ribs come in regular (¥2,750) and large (¥3,980) sizes. Combination plates with barbecued chicken, grilled swordfish, steamed lobster, steamed lobster tail, grilled lamb, grilled steak or grilled scallop brochette are also available, ranging from ¥2,080-2,980. Seafood entrees include lobster, Spanish shrimp, swordfish, salmon, rainbow trout, and a combination platter. Meat selections include charbroiled N.Y. cut sirloin steak (¥2,880), barbecued chicken (¥1,780), grilled lamb chops (¥2,080), London broil (¥2,180), and Roma burger (starts at ¥l,380). DIRECTIONS: follow the directions to Hard Rock Café (above). Tony Roma’s is on the first floor of the same building. Hours: 5-11:00pm, last order at 10:30pm. Telephone: 03-3408-2748 Karen Ozment, date?